Moodyville showcases seven Vancouver artists who have produced works in response to the locale of North Vancouver. The exhibition includes photography, video, drawings and an outdoor work that forms a complex picture of North Vancouver’s sociocultural landscape, one that is still very much defined by its natural setting. The title alludes to North Vancouver’s beginnings and its strong ties to natural resource industries. The earliest industrial settlement on Burrard Inlet established in 1872, Moodyville was a prosperous sawmill community. The exhibition brings to light the shifting identities and distinctive aspects of this place, creating a unique portrait of North Vancouver. 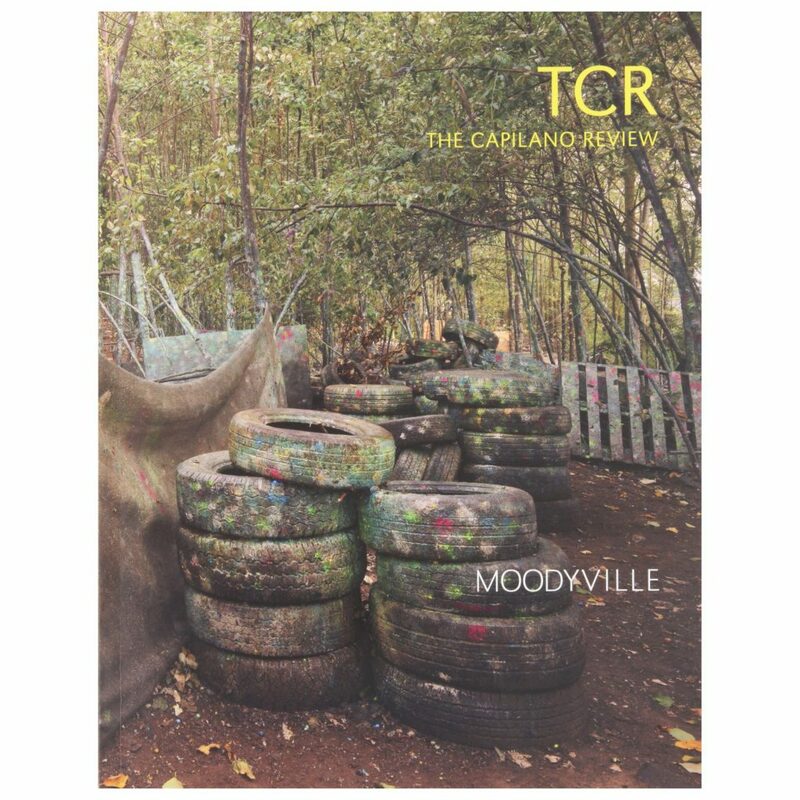 Catalogue co-published by Capilano Review and Presentation House Gallery. Moodyville is financially supported by the B.C. Arts Council Special Project Grant, Spirit of B.C. Opportunities Program, B.C. Museums Association: BC 150 Grant and District of North Vancouver and the City of North Vancouver Office of Cultural Affairs. 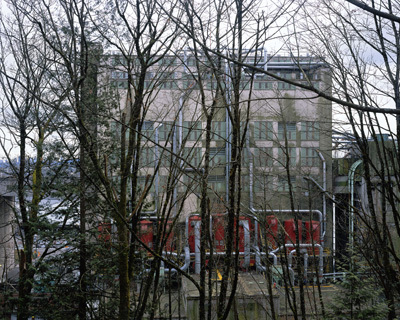 Jim Breukelman, View from Moodyville Park, North Vancouver, 2008. 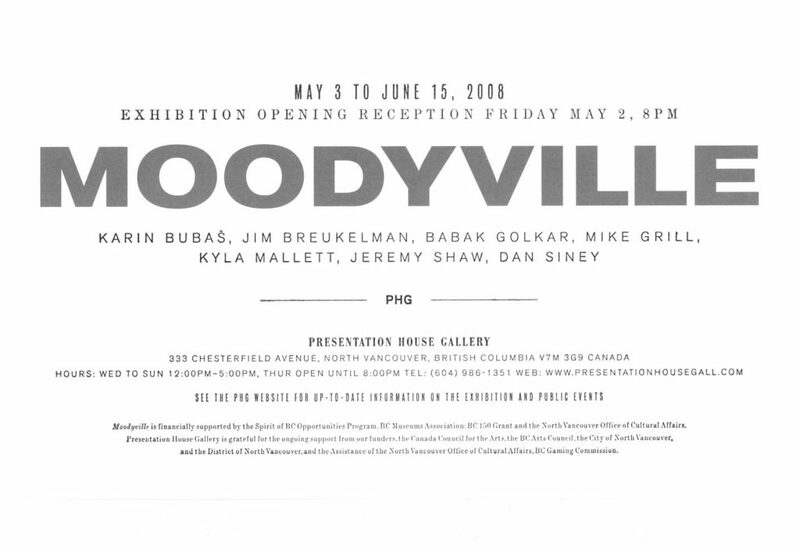 Exhibition catalogue showcasing seven Vancouver artists (Karin Bubas, Jeremy Shaw, Jim Breukelman, Dan Siney, Mike Grill, Babak Golkar, Kyla Mallett) who were invited to produce new works in response to the locale of North Vancouver. These established and emerging artists have brought unique sensibilities and personal experiences to their investigations. Moodyville evokes the distinctive atmosphere and spirit of the place, and brings to light its psychogeography of hidden sites and untold stories. The historically significant title alluding to the city's past as a distant collective memory implies that the identity of a place is always in negotiation with its history. The earliest industrial settlement on Burrard Inlet established in 1872, Moodyville was a prosperous, albeit short-lived, sawmill community that led to the establishment of North Vancouver. This evocation of the city's beginnings makes reference to its strong ties to natural resource industries and suggests how ideas about place are determined by the shifting economies of historical change. Moodyville also suggests a psychic space, a state of mind.